After gaining a solid understanding of your style needs, you’ll be shown various design options including paper samples, fonts, and text layouts. You will receive a custom design board with the options discussed and a full quote based on these choices. Final design will be presented for approval and invitations will go into production. Balance of quote is due at this time. Invitations will be ready for pick up! • Welcome bags and boxes, which may include labels, tags, cards, itineraries, etc. 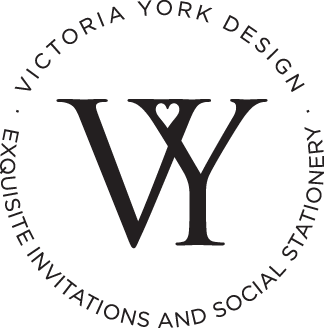 Victoria York Design is all about the details, so this is a place to really show off your wedding design and branding.